We are happy to announce our new product – GSM-GPRS remote IO module TCG140. Тhis product is designed to meet the growing demands in remote monitoring and control projects. TCG140 can be used either as a stand-alone monitoring unit or as a part of a larger SCADA system. Compared to the TCG120, the new TCG140 controller has new features which significantly increase its applications. 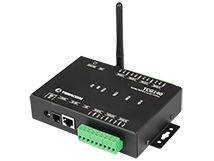 RS-485 interface provides the ability to work not only with the new TST300 and TSH300 Teracom MODBUS RTU sensors but also with various sensors from other manufacturers. Up to 8 MODBUS RTU sensors are supported. The analog inputs are compatible with sensors with 0-10V or 0-20mA current loop outputs. 1-Wire sensors are also supported. This variety of interfaces makes it possible to use different types of sensors for specific applications. The measured values can be sent periodically to a remote monitoring server via HTTP Post method. The new data logger functionality allows the measured parameters to be stored in the controller memory and to prevent loss of data in case of a connectivity problem. Log records can be made at a preset interval or when an alarm event occurs for a monitored parameter. The memory of the logger is for 52 000 records, which is sufficient for at least 4 weeks of recordings in a relatively short interval. The built-in 4 relays with normally open and normally closed contacts enable control of 4 independent processes. The relays can be activated by the alarm status of any of the monitored parameters, SMS, call or HTTP API command. The controller comes in a solid metal box that can be easily mounted on a DIN rail using DIN rail adapters. TCG140 remote IO module has an extended 3-year warranty and will be available at our partners in late June.